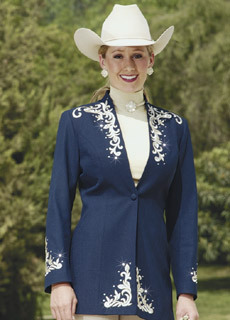 Hobby Horse Mendocino Blazer in Midnite Blue. Gorgeous classic single button front blazer creates a long, slenderizing neckline. 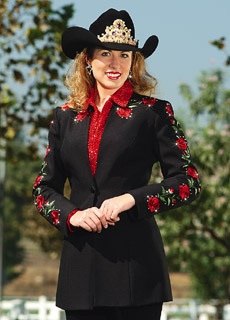 Eye catching embroidery and glittering crystal accidents with a western flair will stay in style for years. A tailored blazer belongs in every show wardrobe and this style, with elegant embroidery and dramatic crystal accents, is a shapely and timeless choice. Poly, dry clean. Size: 2X - LAST ONE!!! 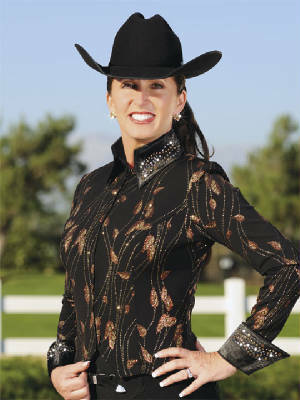 Hobby Horse Lillyana SwitchIt Jacket, Limited Edition. Style and value meet beautifully in the Lillyanna Switchit! Jacket, a glittery approach to versatile dressing on a budget. 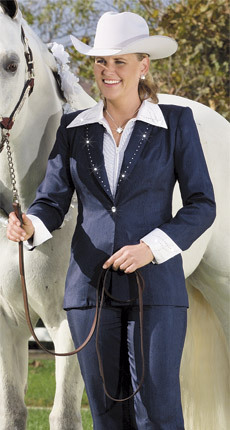 Shapely short jacket works for riding or in hand classes; lovely as is or add any of our SwitchIt! Collar and cuffs sets (sold separately) for more show style. Black black with golden & copper glitter motif. Acetate/lycra, hand wash.
Don't forget the Collar & Cuffs at only $49 for the Classic style or $59 for the Rio style. Richest red roses, dappled with shimmering Austrian crystals, parade down the shoulders and sleeves of this retro-inspired shapely black blazer. Intricately embroidered in six shades of red, each bloom is truly an American beauty. Poly, dry clean. Limited stock available. Original price $279. Hobby Horse is sold out of this item! ON SALE!!! Hobby Horse Spur Up Limited Edition Blazer in merlot. What a classic! Spur Up’s exquisite floral motif embroidery is actually a detailed western spur, and each ‘bud’ in the bouquet is a different rowel highlighted with shimmering Swarovski crystals. Poly, dry clean. Originally $299. 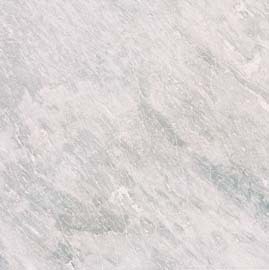 ; reduced to $199. ; reduced again to $169.